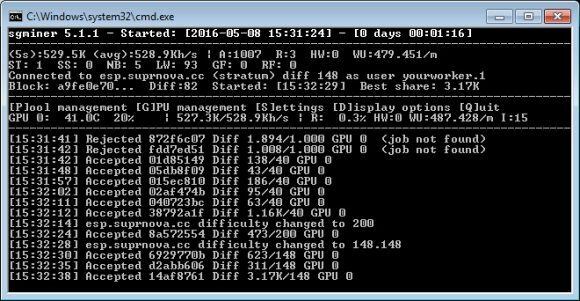 There is now an sgminer fork for GPU mining Espers (ESP) that uses HMQ1725 algorithm available (source) that works on AMD GPUs. The miner is still in an early beta and you may experience issues trying to use it, it is recommended to be with 15.12 drivers as older or newer versions might not work, the latest Crimson release does not for sure. Below you can find a working 32-bit Windows binary or you can compile from the source, though it seems that there are some issues with the source that still need fixing for problem free compilation. We were able to make the GPU miner for ESP work with about 530 KHS in terms of hashrate on an AMD Radeon 280X GPU or with other words a few times higher hashrate than on a high-end CPU using the CPU miner for hmq1725. We were not able to make the miner work properly on 290X, nor on Nvidia GPUs using OpenCL, so if you try the binary you are welcome to report your experience with it. I am on windows 10 64 bit, and I can’t mine espers using hmq1725 cause it won’t create the bin file from the kernel hmq1725.cl. Do not use the latest drivers, try with 15.12 drivers as they seem to work best. The GPU miner is far from perfect and has some issues that still need to be fixed. [12:27:55] Startup GPU initialization… Using settings from pool esp.suprnova.cc. [12:28:56] Error compiling program for search. Error: Creating kernel search failed! [12:28:56] Restarting the GPU from the menu will not fix this. [12:28:56] Re-check your configuration and try restarting. Steven, try with different drivers. We’ve experienced trouble running the miner on some setups even with 15.12, so it is not entirely problem free to make it run. Thanks for the response, still the same error. CCC v 14.9. Is it possible to use a nvidia card? @admin I got it to work with my GTX 780 Ti. Getting around 150KH/s. Which cards does work with this sgminer ?? do u have for intel gpu set files …..
hi, how do you compile the .c files to the .cl files, i dont find anything on this. I’m also looking for compatibility with the Vega 64?